Now that Old Man Winter has finally reported for duty, parents in central Indiana and beyond are watching for the symptoms of cabin fever-a sure sign it&apos;s time to pack up the kids for an energy-burning indoor adventure. Luckily for them, Hamilton County has an impressive array of options. From old standbys such as video-game arcades and bowling alleys (including one that has an indoor miniature golf course) to more recent arrivals like the SkyZone trampoline park and K1 Speed indoor karting, there&apos;s plenty to do when you don&apos;t want to spend time outside. Founded in 2014 by two mothers who also happen to have PhDs in child development, The Urban Chalkboard is billed as a "play café" where parents and children can spend quality time together. On-site learning studios offer music and yoga classes, for example, and the café provides space for imaginative kids&apos; play while Mom has that second cup of coffee. Capacity is limited to 30 children at a time, though, and staff has to restrict entry when the facility is full-as it was when my little friends and I arrived. Before trying again, I&apos;ll be sure to call or check Facebook to make sure we can get in. The sprawling Fishers attraction is popular during mild weather, when visitors can interact with costumed interpreters as they explore different eras in Indiana&apos;s past. And although the historic grounds are closed after the Headless Horseman rides each fall, Conner Prairie&apos;s welcome center is open year-round. 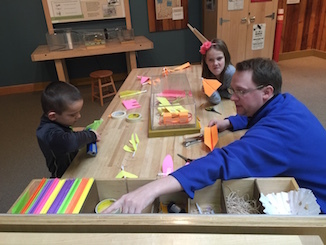 Inside, we found three hands-on activity areas: Craft Corner, Discovery Station, and , a National Science Foundation-funded exhibit that unites history and science. We started and ended our visit there, folding and flying paper airplanes, building and testing chain-reaction machines, and experimenting with electrical circuitry. The scientific theory may have been lost on my companions, but they sure enjoyed watching their creations come to life. When our brains were full, we set off for our next stop. 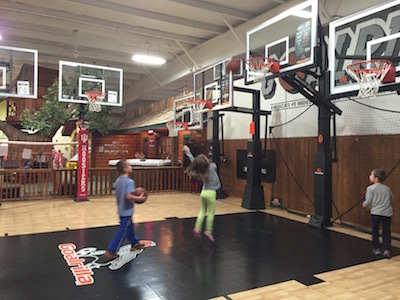 This leisure-time retailer opens its Noblesville showroom to the public for play time every day. 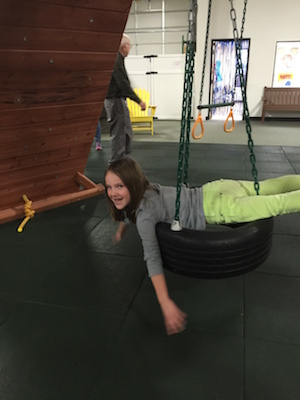 Children 8 and younger can put a variety of outdoor equipment to the test-everything from basketball goals and trampolines to fancy swing sets and playhouses, all set up on a rubber safety floor in the indoor Play Zone area. My companions made a beeline for the trio of trampolines, which are limited to one jumper at a time. Since two were already occupied (and The Girl was quicker to shed her shoes and climb into the one that wasn&apos;t), The Boy grabbed a basketball and starting shooting hoops. I tried playing defense but gave up because he kept changing goals. The Play Zone was crowded and the trampolines were especially popular, so most parents imposed time limits to ensure everyone got a chance to jump. (Recreation Unlimited does not provide supervision.) The Boy split his time between there and the basketball court. The Girl also tried out the swings and measured the playhouses for curtains. When our curfew forced me to give them the five-minute warning, their smiling, sweaty faces told me the trip was a success. On the way home, I asked my test subjects to pick their favorite part of the day. After much thought, they came to the same conclusion: "All of it!" Let the kids get their game on during open gym at the Hamilton County Sports Complex in Noblesville or Jonathan Byrd&apos;s Fieldhouse at Grand Park in Westfield. To burn off even more energy, set them loose on the inflatables at Bounce U in Fishers. Less-physical choices include local library programs, the Taylor Center of Natural History at Strawtown Koteewi Park near Cicero, and the Museum of Miniature Houses in Carmel.